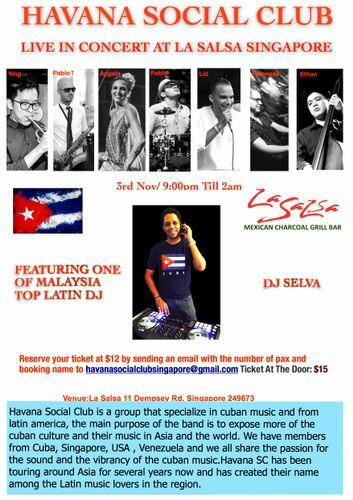 We are very excited to announce that we are going live in full band format at La Salsa Singapore on the evening of the 3rd of November featuring one of Asia's Top DJs, "DJ Selva" coming all the way from Kuala Lumpur. Reserve your ticket by sending an email with the number of pax and booking name to: havanasocialclubsingapore@gmail.com. Havana Social Club will be performing our latest Latin hits additions after a successful sold out weekend in KL featuring Angela Vargas (vox), Lid Ferrera (vox), Pablo Tani (sax),Ying Da (trumpet), Ethan Seow (bass), Phinneas B (keys), Pablo Calzado (drums-vox). Hope to see all our friends there for our final full band concert in 2018.